The being that is called horse. How we perceive horses is what ultimately changes our connection with them. There has been an evolution in the human relation with horses where people realized that horses could speak to us about our (hidden) feelings, emotions, thoughts etc. The result of this movement was that people started looking at horses in a different way. A horse somehow had gotten a voice. But this voice was told to speak about their human companion. The human would still be the center around which the horse would revolve. It reminds of a time in history where humanity thought that the sun and all the planets in the universe rotated around earth. A horse would now, because of that evolution, serve on more planes than the physical one (e.g. carry a human on his back). He would serve on an emotional plane, a mental plane and even a ‘spiritual’ plane. A horse would now teach humans about themselves and even heal their emotions and energy. But, horses are also a beings in their own right. They are not simply existing to serve humans. And they do not communicate and exist on one plane only (planes as mentioned above). 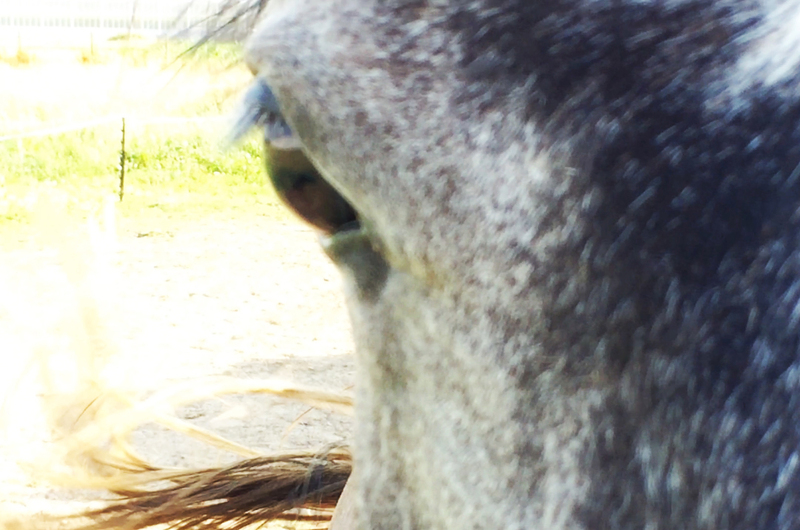 Communication is therefore not only an expression of your horse in his healer role for example. What horses communicate can relate to many factors that come into play. They can speak to us about their own state of being, one or multiple person(s) around him, other horses, the wider environment around them, physical, emotional, mental or energetic expressions, and present, past or even future experiences, or even several subjects at once. Communication is not static and therefore one expression does not always mean exactly the same thing. Meaning, horses can one moment just bite you because they feel nervous or anxious, they can also bite you because they are impatient and want you to give them their food, or they can bite you because you have an energetic block, or they can bite you because you have an aggressive emotion inside of you that you are very much trying to suppress, or they want to tell you they are in pain, etc. There are many possible messages to be found in one good J bite. The perspective we often take, as humans, is that we look at the world from our own point of view. We look at other beings through these coloured glasses. For instance, ‘my horse mirrors me’ or ’my horse is disobedient’ or ‘my horse doesn’t love me’… And when one looks exclusively from this viewpoint, one looks at the world as being there to serve you. It is a self-absorbed perspective. It does not mean that what you perceive is untrue for you, but it does mean that it is not the complete truth. When one can rise ‘beyond’ one’s own point of view and take up multiple perspectives, one can see so much more. There are answers there that couldn’t possibly enter your awareness from a singular point of view. This does not mean you have to give up your point of view, because it does hold valuable information for you. It means that it is wise to expand your view. Resulting sometimes in the simplest conclusion that a horse sometimes just kicks, because he is irritated by a mosquito and that’s it. There is peace to found in this, because it frees us from our own endless self-contemplation. It is necessary to reflect about yourself in your relation to your horse and I encourage this, but it is at the same time important to sometimes just see what is there. Because entanglement in yourself leads to a disconnection of the world around you. This can lead to blindness for relationships that are out of sync and signals of sickness… This is how ‘spirituality’ becomes a trap of the mind, while in fact the essence of ‘spirituality’ is the opposite: truth. When you can see what is said, you can make changes for the better. Many problems arise because of misunderstandings and blanks that are filled in with coloured, singular glasses. This is a given in any relationship, but with beings that cannot express themselves verbally it is even more important to listen more clearly.